Malden, Mass., March 16, 2016– Mayor Gary Christenson, State Representative Paul Donato, City Councillor John Matheson, Police Chief Kevin Molis, employees and residents recently attended the Grand Opening of Ming’s Seafood, a new restaurant located on Pleasant Street at the site of the former Family Dollar Store. Cuisine consists of fresh seafood, vegetable and meat dishes including Dim Sum and they also serve beer and wine. Wah Lum Kung Fu & Tai Chi Academy performed their traditional Lion Dance to bring good luck and fortune to the new restaurant. The following pictures were from dinner by National Asian Women Association(NAWA)’s gathering at Ming’s. Van Amanda Le, president of NAWA’s MA chapter, enjoyed the seafood and nice paintings on the wall very much. 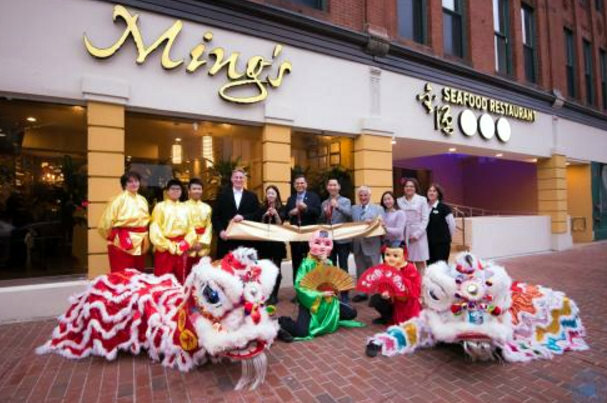 Ming’s owners Ling Zheng and Jay Chen have invested nearly $2 Million to improve the façade and interior creating an elegant dining experience. The business currently employs nearly 40 people, including several from Malden.